THE WORLD IS discovering what a lot of us Burqueños have always known—Albuquerque’s wildly divergent attractions make it a great place to live. With its big events, small-town atmosphere, instant access to the outdoors, and views that swallow more land than some entire Eastern states contain, the city keeps scoring top rankings from groups with little in common. Experts at AARP, All About Beer Magazine, Livability.com, MarthaStewart. com, Outside magazine, Singletracks. com, and a slew of others name the Duke City a “best city” for big events, beer and breweries, food, road and mountain biking, viewing sunsets, high-altitude running, museums, and hiking, among other amenities. It’s also tops for active families, twenty-somethings, and retirees. Albuquerque also makes it easy to buy a new house. John Garcia, executive vice president of the Home Builders Association of Central New Mexico, defines the competitive entry-level market as under $150,000, the midmarket as $150,000– $200,000, and the high end as $200,000 and up (it actually goes way up). First-time buyers with families can swing an energy- efficient three-bedroom on a budget, in a neighborhood surrounded by parks, trails, and retail amenities. From neighborhoods within minutes of a freeway, lots of folks drive to jobs in pricier Santa Fe from the metro’s northern tier, or grab a serene, Wi-Fi-enabled ride on the Railrunner commuter train to their jobs in the capital. And where the city ends, it really ends: mesas, mountains, and grasslands roll away in stage-lit glory to every horizon. You’ll never find a better way to scope out the new-home market here—and snoop behind closed doors—than the semi-annual Homes of Enchantment Parade, happening this fall on October 10–12 and 17–19. This local tour gets you, at no cost, inside everything from affordable tract homes to high-end luxury estates. (Home builders associations around the state organize similar tours—see p. 22). The parade makes a perfect complement to the overlapping International Balloon Fiesta, whose morning events conclude shortly after sunrise, leaving days free for touring open houses. The event proceeds like a progressive dinner for the house-hungry. Spectators cruise the city and file through the houses on a self-guided tour. Each year’s edition delivers new delights, new surprises, new neighborhoods, new builders, new buzz-words. Insiders sometimes joke about the “arms race” (see “Bells and Whistles,” p. 19), which can pit builder against builder as they deck out kitchens, for instance, with the latest high-tech weapons of mass seduction—professional-grade six-burner stoves, refrigerators you could get lost in, mirror-finish granite countertops imported from Italy. The first $1 million home hit the Duke City parade in the early 2000s, and prices rose well above that in the next few years. At its peak, the parade featured more than 120 homes. The so-called economic downturn cooled off that white-hot building boom, but the market is rebounding. The parade might reach 50 homes this year—more than the most devoted house junkies can cover in two weekends. Start browsing homes by location or price on paradenm.com. The Albuquerque Journal publishes all the info you need to navigate the tour, including an artist’s rendering of each home, detailed driving directions, and maps. Temporary directional signs sprout around the city, pointing the way to each home on the tour. The variety always amazes. John Garcia said home prices on the spring tour ranged from $170,000 to $1.5 million. Styles typically include traditional and contemporary Southwest; Pueblo and Territorial; Euro-evocative Tuscan and Old World; and contemporary and modern. You’ll visit patio homes, high-density suburban neighbor- hoods, and glamorous estates with more square footage than a small-town mall. Garcia sees another trend in multigenerational housing, be it the traditional mother-in-law quarters or a semi-detached casita for college students living at home. And each parade usually includes at least one remodel. Approaching one million residents, the Albuquerque metro area sprawls over nearly 60 miles from Algodones south to Belén and about 40 miles from the city’s west side to the East Mountain town of Edgewood. Elevation ranges from about 5,000 feet in the Río Grande valley to 7,000 feet-plus near the Sandía Mountains, which top out at 10,678 feet. Within that geography you’ll find forested mountains and stark mesas, tumbling foothills and deep canyons, irrigated valley bottomlands and knife-edged ridges, suburban neighborhoods and downtown infill. The parade carves the metro into several regions. 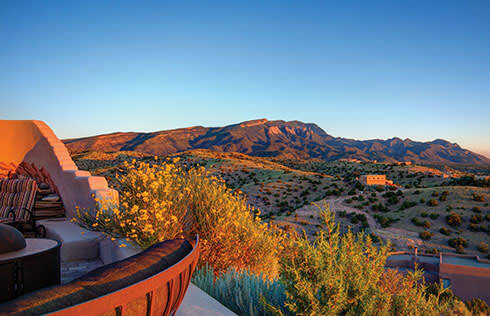 To the north, Bernalillo, Algodones, Corrales, and Placitas deliver wide-open spaces, convenient Albuquerque or Santa Fe commuting, and truly stunning homesites at the feet of the Sandías’ craggy North Peak. Expect homes with large lots— often acreage—unique floor plans, and abundant custom features. The East Mountains—behind the Sandías—include Cedar Crest, Sandía Park, Paa-Ko, Edgewood, and San Pedro Creek, north of I-40, plus Tijeras and the Manzano Mountains area, to the south. Many of these communities tilt toward the high end of the pricing spectrum, and feature golf-course living, lots with dramatic views, or secluded woodsy charm. With its higher elevation, the area gets more rain and snow than the rest of the metro—and trees. In town, the Río Grande roughly bisects Albuquerque. Most of the new growth—and many of the best deals on affordable square footage, especially for first-time buyers—happens on the western and southern perimeter, where builders offer specific product lines of homes built on their lots at fixed, competitive prices. Many sport impressive green-built features. Elegant custom homes on large lots with at-your-doorstep Sandía views characterize the far Northeast Heights. Elsewhere, infill lots around town feed the growing appetite among younger and older buyers alike for urban living in trendy neighborhoods. These include the hipster haven of Nob Hill, near the University of New Mexico, and the reborn Sawmill area, just north of downtown, within walking distance of Old Town and the museum district. Master- planned Mesa del Sol, on the south side, is developing residential and commercial neighborhoods in a high-style live-work community along New Urbanist lines. You can also find active adult communities for retirees or empty nesters toward the perimeter of the metro at places like Jubilee Los Lunas. This year, the parade’s featured builder, Sun Mountain Construction, is showing a luxurious, 4,900-square-foot, sustainably built contemporary home designed for entertaining in the Oxbow neighborhood, on the west bank of the Río Grande, just above a lovely bend in the river. Nearby, at the parade’s 30-lot Signature Community, Ventana de La Luz offers downsized but elegantly appointed single-story homes, all green-certified, plus a swimming pool, tennis courts, and nearby shopping and fine dining. Floor plans range from 1,900 to 2,100 square feet, and prices start at $325,000. Charles C. Poling covered the Homes of Enchantment Parade for 11 years as editor and associate publisher of Su Casa magazine.